The RACAgent is a hidden scheduled task that is automatically configured during system installation. This task is responsible for gathering reliability data and displaying it in chart view. The RACAgent task typically runs once every hour, but it will not wake the computer if it is sleeping. If the system is a laptop running on battery power, RACAgent.exe will imme¬diately exit if the battery capacity is less than 33 percent. 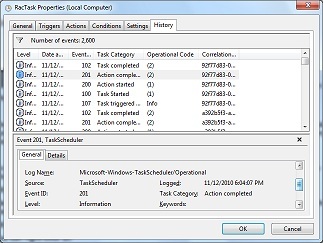 To view the RACAgent task, open Task scheduler. In the Task Scheduler Library, navigate to Microsoft\Windows\RAC. Be sure to enable the option to Show Hidden Tasks, available from the View menu (View | Show Hidden Tasks). In the center pane, you can right-click on RacTask and select Properties to access a host of details and options for the task. 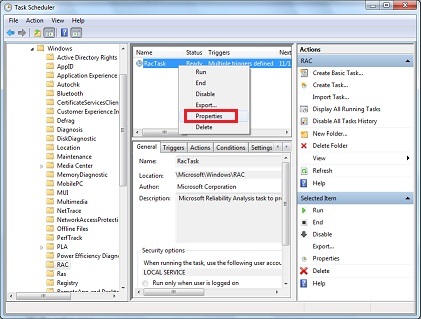 If you do not want to track system stability, you can disable the RACAgent task by selecting the Disable option that is also available when you right-click on RacTask in the center pane. Tip adapted from Windows 7 Resource Kit by Mitch Tulloch, Tony Northrup, Jerry Honeycutt, Ed Wilson, and the Windows 7 team.